This easy roasted cod recipe with hazelnut and cilantro pesto packs in loads of flavor but takes only about 15 minutes to make, start to finish. There are two “secret” factors why this flavor-packed roasted cod recipe tastes so good: you pan roast the cod to bring out its sweet flavor, and then you top it with a fabulous cilantro hazelnut pesto, which you make in your food processor or blender in less than 60 seconds. Pan roasting usually works best for thick steaks of dense fish such as swordfish, tuna, or halibut requiring slightly longer cooking time. 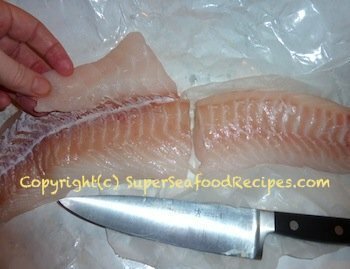 Cod, by contrast, typically comes in filets, flakes easily, and cooks quickly. So why pan roast cod? Well, once you taste this pan roasted cod recipe, the flavor will tell you why! Cod usually has a fairly delicate flavor, easily overpowered by sauces. But pan roasting cod enhances its naturally sweet flavors because you quickly sear the filets on each side to seal in the flavor, which also creates a tasty light brown crust. Pair the pan-roasted cod with a pesto or other tasty sauce, pop into the oven for a couple of minutes to finish cooking, and you’ll have an addictively delicious combo. Probably professional cooks pan roast cod filets routinely as a way to intensify their flavor, but I discovered the benefits by accident after buying a gorgeously fresh cod filet that turned out to be very thick in one area and quite thin in another. If you want, you can check out my instructions for pan roasting fish steaks - but keep in mind that cod requires shorter cooking times. Quite honestly, you probably won’t want to serve this recipe to guests, unless you’re better with a spatula than I am. For me, the roasted fish does always fall apart slightly when I remove it from the pan to a serving platter (and no, I don’t drink that much wine while it’s cooking). However, it’s perfect for family meals. 1. If you bought a large cod filet, cut it into 2-3 pieces to fit it into your cooking pan. Cod cooks best if it’s an even thickness (which most cod filets are not), so fold over the thin areas to make a thicker layer, as you can see in the photo. Pat the fish filets dry so they’ll brown well, as this enhances their flavor. Sprinkle the cod lightly with salt and pepper. 2. Heat a skillet or sauté pan large enough to hold the cod for 3-4 minutes over medium-high heat. If you sample the pesto before cooking, you'll be shocked by how strong the garlic, ginger, and cilantro taste. Don't worry - a few minutes in the oven totally mellows and transforms the flavors. 3. While the skillet is heating, toss all of the pesto ingredients into your food processor, and process for about 20-30 seconds until fairly smooth. Stop the processor, scrape down the sides of the bowl, and pulse a couple more times. That’s it – the pesto is done. 4. Measure out 1/3 cup of wine, which you’ll eventually use to deglaze the pan. If you want, pour a glass of wine for yourself. 5. Add the canola oil to the skillet, and tilt the pan to cover the bottom. Heat for another minute. Add the cod filets. Cook for 2 minutes only, loosen with a spatula, and flip over. Cook another 2 minutes, loosen again with your spatula, and spread about half the pesto over the top of the filets. (Freeze the other half to use another time, perhaps to flavor a soup or steamed veggies, or as a pasta topping.) Pop the fish into the oven to finish cooking. 6. Sit down, and sip your wine for a couple of minutes. 7. Use a fork to check carefully for doneness after only 4-5 minutes. As soon as the cod looks opaque but it flakes easily, remove it (be very careful to use oven mitts, as the pan will be extremely hot). Don’t worry, the cod filets will continue cooking for another couple of minutes because the pan is so hot. 8. Still being careful not to touch the hot pan, use a spatula or two to carefully remove the fish and place it on a serving platter (this is when it sometimes breaks apart a little for me; if this happens to you, just fit the pieces back together on the platter and smooth the pesto sauce over them – no one will notice. 9. Using your oven mitts, return the cooking pan to the burner over high heat, and pour in the 1/2 cup wine; deglaze the pan by stirring to dislodge any brown bits stuck to the bottom. Continue cooking and stirring until the wine reduces by about 50% and is slightly syrupy. Remove from heat and pour over the top of the pan-roasted cod. 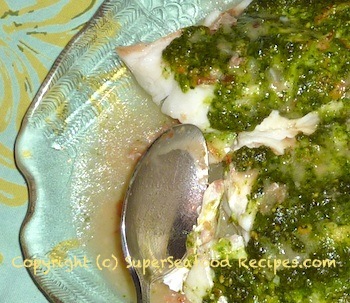 This blends with the pesto topping and pools a bit around the fish, blending the flavors. Serve this delicious roasted cod with hazelnut-cilantro pesto sauce with rice and a couple of full-flavored vegetable dishes, such as mashed butternut squash and spinach sautéed in garlic, olive oil, and red pepper flakes.